My sole yearns for shoes!!! I've had a magnetic primal attraction to shoes since I can remember. While girls in middle school were buying fun Watch rings and Teen Beat Magazine, I was begging my mother to order platforms from Delia's (OK, I was buying Teen Beat too, but just for the articles!). When I got older, I started stock piling shoes and when I went off to college at The Fashion Institute of Technology in NYC, it continued. Unfortunately for me, the only think that changed was that my "taste" in shoes, if you will, only made for higher and higher price tags. When I discovered Christian Louboutin shoes my freshman year of college, my heart ached for them! The glamour, the sophistication, the juicy red soles! But with a price tag of $600+, I couldn't af ford them and still can't (my heart is breaking as I type this!). My love for the sky high, ultra feminine, vamped up signature silhouette of Christian Louboutin shoes however, has stuck with me all these years and I still drool at the thought of them. My solution? 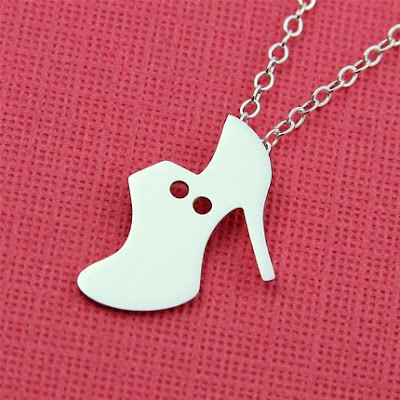 These sweet little Christian Louboutin inspired shoe necklaces! 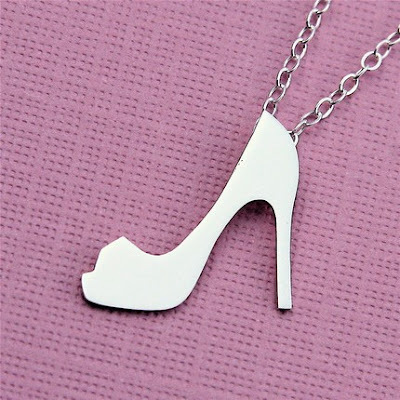 Sky high, ultra feminine, vamped up shoe luxury for your neck. Think of them as a place holder for when we can march into our nearest Neiman Marcus and walk out the proud owner of a pair of shoes that costs just about as much as insuring your car for a year. Will it be worth it? You bet it will! But for now, these necklaces and their $48 price tag will make a lovely stunt double. Available for purchase my Etsy Store.